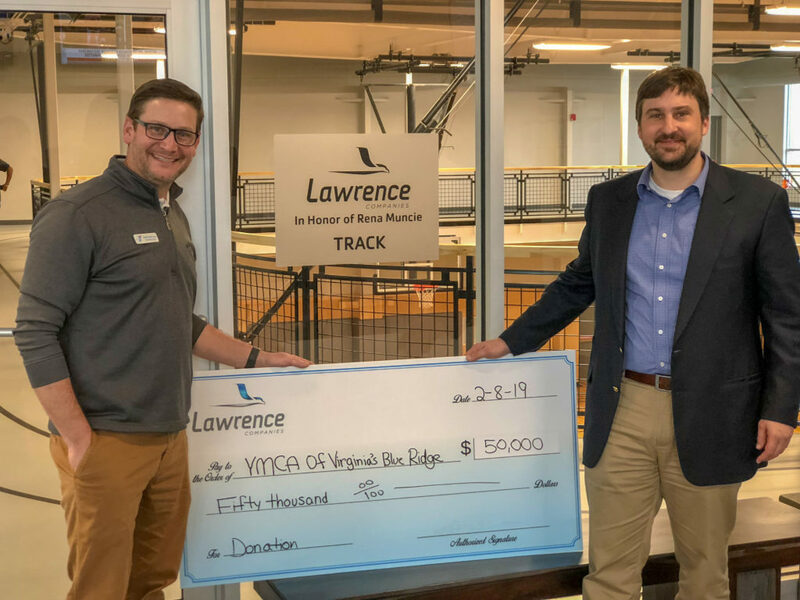 ROANOKE, Va. (February 11, 2019) – Lawrence Companies, leaders in the moving, storage, construction equipment, and freight businesses, announced an additional contribution of $50,000 to the YMCA of Virginia’s Blue Ridge. The gift is the second $50,000 pledge for the new Botetourt Family YMCA. The Botetourt Family YMCA recently opened its doors on January 1, 2019 at 115 Shenandoah Avenue in Daleville Town Center. The new, state-of-the-art facility includes premium health and wellness space, including an eight-lane lap pool, a warm-water recreation and therapy pool, three group exercise studios, a gymnasium, a modern lobby with social gathering spaces and lots of space for kids and teens to learn and play. Founded in Botetourt County in 1932, Lawrence Companies has a deep-seeded commitment to the community. Lawrence Companies has held a strong presence in the community through volunteer work, sponsorships, donations, and community engagement for decades. The Botetourt Family YMCA has seen early success with membership numbers totaling more than 3,000 individuals to date. Preliminary programming includes 45 different classes, according to Johnson. That number will quickly grow into new classes based upon YMCA member feedback, providing a unique assortment that truly caters to those participants. At Lawrence Companies, we pride ourselves in exceeding customer satisfaction through our relentless pursuit of the highest level of customer service. We are always looking for talented and passionate team members! If you need an accommodation to complete a job application with Lawrence Companies, please contact us at 800.336.9626 or hr@lawrencecompanies.com. All right reserved © Lawrence Companies 2019.